Sure things weren’t perfect. To begin with, this wasn’t a basted fitting as requested. The single button closure had already been cut. The lapels were a hair too wide. The pleats were reverse, not forward. The sleeves a bit too full. The right shoulder set incorrectly. And a couple of other details to tedious and small to mention were a bit off. As a matter of fact, they got really close. Especially considering that this is a made-to-measure garment. 95% of my emailed list of 30 demands had been completed and done very nicely, too. There was the grosgrain covered button, the high fishtail waist in back, the button fly, handcanvassing in the chest and a beautiful belly to the lapels. Somewhere an actual live tailor got his hands on this garment and got to work. And he’s going to get to have another go at it. This sort of garment seems like it takes a lifetime to complete. But it will last a lifetime and look even better with age. That’s the beauty of handstitching and good fabric. And the fun of working with someone who understands what you want and even more so, what you expect. 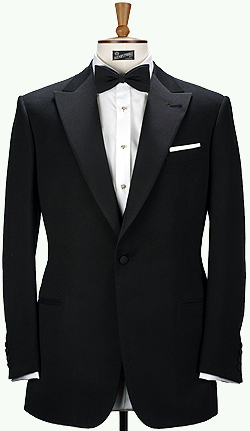 This entry was posted in Elegantology and tagged clothing, dinner jacket, Elegantology, formal, tailoring. Bookmark the permalink. What a fun surprise to find your site after reading your insightful comment on the Peak of Chic’s post today. Lovely to meet you. Am wondering, and I am putting myself out there a bit as this might be obvious, what shoe should a gentleman wear with his formal wear. I have tried to talk Mr. Blandings into a patent slipper and I get a slow blink. Would love your thoughts. And thank you for your kind words. I’ve enjoyed stopping by your blog, too. I laugh because Mrs. E and I refer to our place as “Blandings House” after a frightening and long drawn out renovation. To answer your question, there are two schools of thought on formal shoes. Patent leather and calf. I wear an opera pump sometimes as it is the only hold-over from the regency days. At home I may choose my velvet “prince Albert” slippers. Out on the town I may wear my thin soled, thin waisted, black calf plain toe oxfords (highly polished), especially if the weather is inclement. Calf pumps with the dulled rubbed silk bow are extremely sophisticated. Will Dynend of A Suitable Wardrobe wears a patent lace-up with silk ribbon laces. He is a very good “conservative” dresser in the 1930’s sense. A good compromise, in my opinion, is the Belgian slipper in black leather. Extremely comfortable and sleek enough, if a bit nonchalant, if footwear can be nonchalant. After they are a bit worn in, have your husband take them to the cobbler and have a thin rubber sole added. They look well with jeans or flannels at home, too. Wonderful – this is just what I needed. He was spot on with his choice of highly polished black calf plain toe oxfords. I’m ordering up a pair of the velvet slippers to replace the ghastly l.l. beans. You’re a doll. I’m adding you to my blog roll straight away. A pleasure and thank you, although you my want to read today’s post to be sure about recommending me to a discerning reader…. I do have my soapbox issues.